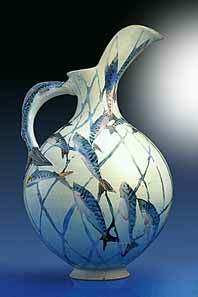 Port Isaac jug with fish design 1998. Michael and Barbara Hawkins are the proprietors of Port Isaac Pottery. Michael is the potter, and Barbara, the decorator. Michael grew up in the lovely fishing village of Port Isaac, but has spent most of his career away from home, only returning to Port Isaac in 1996. His work is hand thrown stoneware, and he is forever experimenting with new techniques - using a 50cu.ft. oil-fired kiln and an electric kiln. Barbara can be seen from the showroom, doing the intricate decorative work with the speed and assurance that come with true craftsmanship. Since returning to Cornwall, much of the work has become influenced by the close proximity of the sea, and fish figure prominently in many of the designs. Their home - once the village Sunday School - overlooks the harbour. Port Isaac Pottery is situated in the picturesque Cornish fishing village of the same name. Michael and Barbara Hawkins moved there, to a beautiful converted Methodist chapel, in 1996, from Stroud, Gloucestershire where they had a pottery for eighteen years. Their work is stoneware, hand thrown and individually decorated. Precious metal lustres and gold are applied, and each piece has at least three firings. The bold and elegant forms complement the watercolour-style decoration. Both oil and electric kilns are used. Port Isaac ceramics are collected and exhibited nationally and internationally. The Port Isaac Pottery showroom is open to visitors all year, and is well worth a visit, not just for the thrill of seeing the beautiful work en-masse in the lovely chapel with its organ loft and music gallery, but for the pleasure of spending some time such an attractive, pleasant village.